Junior guard Ryan Kruser scored 11 points in Potosi's narrow 58–57 non-conference win at Lancaster last Saturday night. POSTED January 24, 2019 9:47 a.m.
HIGHLAND — Against the host Highland Cardinals last Thursday night, coach Mike Uppena’s Chieftains put up just 12 more shots and five fewer free throws than their opponent, but managed to come away with a convincing 53–32 victory in Six Rivers West Conference action. With Thursday night’s conference win, the Chieftains improved to 7–0 in league play and stretched their lead to two games over Shullsburg (5–2) and Benton (5–2) with five conference games remaining. The Potosi boys proved to be a much more efficient team than their opponent’s last Thursday night, which made all the difference in collecting the win and remaining unbeaten. Coach Uppena’s squad took 58 total shots, making 22, for a 38 percent clip, while Highland took a total of 46 shots, making just 12, at 26 percent. From 3-point range, the Chieftains made 4-of-20 (20 percent) attempts, compared to Highland who went 0-for-11. At the free throw line, Highland made 8-of-13 (62 percent) attempts to Potosi’s 5-of-8 (63 percent). As is typical for the Chieftains too, they out-rebounded their opponent 47–27, pulling down 18 offensive boards to Highland’s eight, and 29 defensive boards to Highland’s 19. 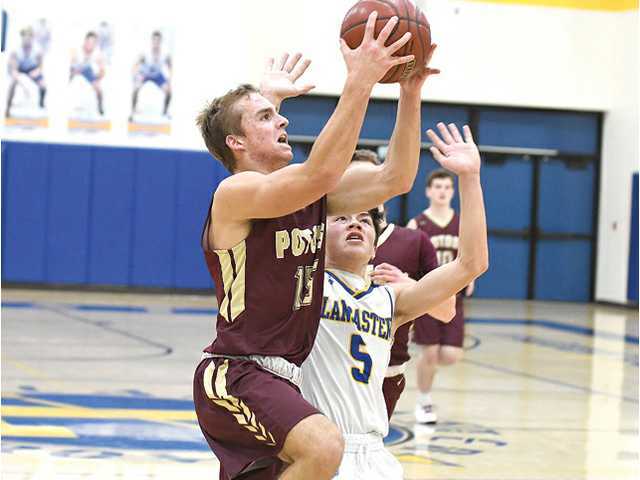 Junior Ben Udelhofen led Potosi with 14 points on 6-of-9 shooting from the field, while senior Brady Curtis and junior Ryan Kruser each finished with 11 points. Curtis also pulled down a team-high eight rebounds to go along with two steals. Seniors Nick Edge and Will Bierman each chipped in six points. Bierman also dished out a team-high five assists in the win. Highland, who trailed 28–21 at the half and was outscored 25–11, in the second half, fell to 1–6 in league play with the loss. Saturday night, Potosi traveled to Lancaster where they collected a 58–57 non-conference victory over the Arrows on a late free throw by Brady Curtis. Potosi held a halftime lead of 36–28 and led throughout the entire first half, but it the Flying Arrows who outscored the Chieftains, 29–22, in the second half. With 3:24 to play in the game, Potosi was clinging to a 55–54 lead, which Curtis extended to 56–54 20 seconds later by making one-of-two free throw attempts. With 2:39 showing on the clock, Lancaster senior Cole Kreul went to the line looking to tie the game, but made one-of-two free throws to make it a one-point game. Neither team scored for the next two minutes, and with 45.5 seconds to play, Bierman made one-of-two free throw attempts, putting the Chieftains up 57–55. A missed shot my Lancaster on their end of the court resulted in a Potosi rebound and a foul, sending Ryan Kruser to the line with 25.9 seconds to play. Kruser missed the front end of a bonus, which Lancaster took full advantage of with the game-tying basket by junior Dawson Bowen, and only 3.4 seconds to play. Following a timeout by Potosi with 2.5 seconds left, coach Mike Uppena drew up a play that had Ben Udelhofen complete a full-court pass to a streaking Brady Curtis, who caught the ball in stride, took one dribble to the basket, and was fouled on an up-and-under attempt with three-tenths of a second to play. Curtis bounced the first free throw attempt off the rim and into the basket for a 58-57 lead, then missed the second on purpose, giving Lancaster no chance to rebound and get a shot off in time. In the final three minutes, Potosi made just 3-of-7 free throw attempts, and finished 14-of-28 (50 percent) in the game. The Chieftains didn’t shoot particularly well from outside either, where they were just 2-of-24 (8 percent) from 3-point range, compared to 6-of-15 (40 percent) for Lancaster. Bierman led a balanced scoring attack for the Chieftains, finishing with 15 points and a team-high four assists. Curtis added 12 points, while Kruser finished with 11 and Edge chipped in nine. Udelhofen was close behind with eight points to go along with a team-high nine rebounds, while Kruser led the team in steals with five. The Chieftains will travel to Barneveld on Friday night as part of the Six Rivers East/West Crossover series, featuring the top teams in each of the two conferences. Potosi (10–1, 7–0) — Ben Udelhofen 14, Brady Curtis 11, Ryan Kruser 11, Nick Edge 6, Will Bierman 6, Austin Uppena 2, Ethan Groom 2, Jaydon Carbone 1. Totals – 22-58, 5-8 53. Highland (3–10, 1–6) — D. Miller 15, Kutzke 7, Hying 2, Michek 2, Linscheid 2, Patzner 2, Frost 2. Totals – 12-46, 8-13 32. 3-point goals — P: 4-20 (Curtis 2, Bierman 2), H: 0-11. Total fouls – P: 14, H: 11. Fouled out – none. Potosi (11–1) — Ben Udelhofen 8, Will Bierman 15, Brady Curtis 12, Ryan Kruser 11, Ty Dressler 2, Ethan Groom 1, Nick Edge 9. Totals – 21-59 14-29 58. Lancaster (4–8) — Cole Kreul 4, Hayden Knapp 9, Dawson Bowen 16, Aaron Murphy 4, Preston Noethe 8, Cole Raisbeck 2, Ryan Gallinger 5, Hayden Wagner 9. Totals – 20-46 11-20 57. 3-point goals — P: 2-24 (Bierman 1, Kruser 1), L: 6-16 (Knapp 1, Bowen 1, Nothe 1, Wagner 3). Total fouls – P: 20, L: 15. Fouled out – none.